ENELYTIX is a cloud-based environment for simulating and forecasting power market operations and their co-ordination with natural gas pipeline systems. Power market modeling is a business and through ENELYTIX, Newton Energy Group provides key services to help customers run this business efficiently. 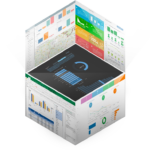 Allow our users to explore simulation results directly in Excel. “With AWS, our customers pay for hardware resources only when they use them. Through icCube’s incredibly efficient backup and restore process we are able to keep servers on AWS shutdown when users are not working with reports and activate them quickly when a user wants to revisit simulation results. Users run simulations on their own schedule. With the Partitioning module that supports flat file data sources, anytime a customer runs additional simulations, we can quickly load the output data into an existing Cube without any additional pre-processing.